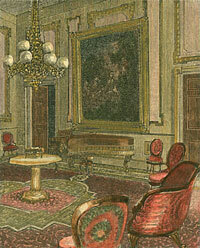 According to a description of the Red Room by journalist Noah Brooks, “The furniture is very rich — of crimson satin and gold damask, with heavy gilded cornices to the windows and a profusion of ormolu work, vases, etc., some of which stuff is very ancient, being bought or presented during Monroe’s and Madison’s administration. There is a grand piano in this room and a full length portrait of Washington [by Gilbert Stuart].”2 The piano may have been useful since Ward Hill Lamon sometimes gave impromptu vocal concerts in this room for the President. As he advanced through the room, he evidently controlled a desire to shake hands all round with everybody, and smiled good-humouredly till he was suddenly brought up by the staid deportment of Mr. Seward, and by the profound diplomatic bows of the Chevalier Bertinatti. Then, indeed, he suddenly jerked himself back, and stood in front of the two ministers, with his body Mr. Seward formally presented the minister, whereupon the President made a prodigiously violent demonstration of his body in a bow which had almost the effect of a smack in its rapidity and abruptness, and, recovering himself, proceeded to give his utmost attention, whilst the Chevalier, with another bow, read from a paper a long address in presenting the royal letter accrediting him as ‘minister resident’; and when he said that ‘the king desired to give, under your enlightened administration, all possible strength and extent to those sentiments of frank sympathy which do not cease to be exhibited every moment of frank sympathy which do not cease to be exhibited every moment between the two peoples, and whose origin dates back as far as the exertions which have presided over their common destiny as self-governing and free nations,’ the President gave another bow still more violent, as much as to accept the allusion. It was in this room that men gathered at the end of President Lincoln’s First State Dinner on March 28, 1861. Having separated the men from the women, President Lincoln had John Nicolay separate the cabinet members into another room where an emergency cabinet meeting was held to discuss the threat to Fort Sumter. He revealed — to the consternation of those present — that General-in-Chief Winfield Scott had urged that both Fort Pickens and Fort Sumter be abandoned. Postmaster General Montgomery Blair, who favored aid to Fort Sumter, blamed Scott’s advice on Secretary of State William H. Seward, who opposed such aid and who had a close relationship with General Scott. That night, “Lincoln’s eyes did not close in sleep,” according to Secretaries Hay and John Nicolay.5 The next day, President Lincoln took the unusual step of asking cabinet members for their written advice on both forts. The Red Room was not usually part of the public rooms used during levees so furniture from the East Room and Blue Room was temporarily stored in the Red Room. 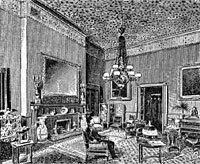 It was also in the Red Room where spiritualists conducted a notable seance for Mrs. Lincoln. 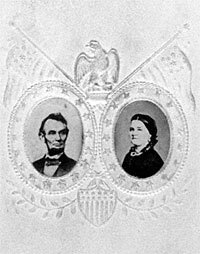 Most seances for Mary Lincoln were conducted outside the White at the homes of friends, but occasionally the mediums came to the Lincolns’ home. Nettie Colburn Maynard reportedly conducted one such encounter with the spirit world in the Red Room. It could also be used for other kinds of informal entertainment — such a presentation by humorist Stephen Masset in June 1864. Michael Burlingame, editor, Lincoln Observed: Civil War Dispatches of Noah Brooks, p. 81. Ruth Painter Randall, Mary Lincoln: Biography of a Marriage, pp. 263-264. Fletcher Pratt, editor, William Howard Russell, My Diary North and South, p. 22-24. Carl Sandburg, Abraham Lincoln: The Prairie Years and the War Years, p. 224-225. Allan Nevins, Frémont: Pathmarker of the West, p. 516-617. Allan Nevins, War for the Union, Volume I, pp. 426-428. Michael Burlingame and John R. Turner Ettlinger, editors, Inside Lincoln’s White House: The complete Civil War Diary of John Hay, p. 123. Katherine Helm, Mary, Wife of Lincoln, p. 200. Rufus Rockwell Wilson, Intimate Memories of Lincoln, p. 427. William O. Stoddard, Inside the White House in War Times, pp. 174-175 13. Willard H. Smith, Schuyler Colfax, p. 207. Thomas Pendel, Thirty-Six Years in the White House, pp. 39-40.